Ubuntu Linux: What & Why? 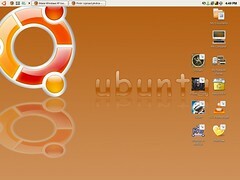 Previously, I’ve said that I wanted to learn Ubuntu Linux. I’m totally a newbie with Linux operating system. Therefore, I think it is important for me to start from the very beginning with the question ‘What’ and ‘Why’. So, I will blog along my way during the process of learning Ubuntu. After reading a few articles available from the net, I came up with a conclusion for beginners like me. Before we look into Ubuntu, there are 3 keywords we need to know: GNU, Debian and Gnome.